Health workers in many countries struggle with how to advise women on acceptable, feasible, affordable, sustainable, and safe (AFASS) options for infant feeding in the context of HIV. Making an informed decision about infant feeding is particularly critical for HIV-positive women to reduce the risk of HIV-transmission to their infants. WHO, UNICEF, UNAIDS, and UNFPA recently updated their joint guidelines (link to http://www.who.int/child-adolescent-health/publications/NUTRITION/ISBN_92_4_159122_6.htm) on infant feeding options for HIV-positive women, but such international reference materials often are not available in a form useable by frontline health workers. 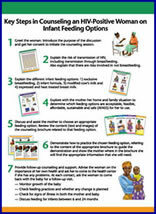 Tanzania is one of the first countries to develop—and now apply on a national scale—a comprehensive set of job aids on infant feeding and HIV/AIDS that feature high impact graphics and easy-to-follow instructions, reflecting the international guidelines aimed at reducing the risk of transmission of HIV from mother to child. 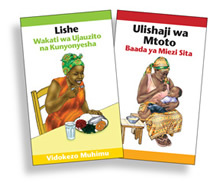 The Q&A; guide provides a step-by-step procedure for using the job aids to counsel HIV-Positive women on infant feeding options. Link to Key Steps. The need for counseling job aids reflecting the updated international guidelines was first identified during the development of the a global compilation of programme evidence by URC/QAP in 2003 and formative research conducted in Tanzania. 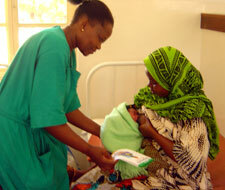 The materials were adapted from several generic counseling tools designed by WHO, UNICEF, and USAID. Funded by USAID and the President’s Emergency Plan for AIDS Relief (PEPFAR), development took place under QAP-supported operations research conducted in 2004 in close collaboration with the Univerity of Bergen, Norway and the Kilimanjaro Christian Medical Centre (KCMC) in Moshi District, Kilimanjaro. The Ministry of Health and the Tanzania Food and Nutrition Centre (TFNC) were major contributors, as were a number of other organizations and national stakeholders An interactive and systematic process was followed to allow both international experts and national stakeholders to review, critique, provide inputs and guide decisions at strategic points throughout the development phase. Stakeholder consensus was an important consideration in the final design of the job aids. Healthcare workers throughout Tanzania are currently being trained to effectively use the tools to counsel prenatal and postpartum women to make informed decisions about their infant feeding options and to help women safely practice their chosen infant feeding method. The materials use compelling graphics and easy-to-follow text to facilitate their use and understanding of key messages. To create the imagery, QAP’s team used a state-of-the-art process that employs digital photography, imagery scanning, and computer design graphics. The Ministry of Health of Tanzania is providing substantial direction in the training of nurse counselors and the disseminating of the job aids in multiple regions of the country through government facilities. Reflecting growing interest in the adapatation of these job aids for other settings, QAP has worked with national authorities in Uganda and Zimbabwe to adapt the job aids for use by both their National Programmes for the Prevention of Mother to Child Transmission (PMTCT) and Infant and Young Child Feeding (IYCF). 6 Counseling/Take Home Brochures: Exclusive Breastfeeding, Infant Formula, Cow’s Milk, Expression and Heat Treatment, Nutrition, and Feeding a Baby. Although the materials were developed for use with women in antenatal care clinics and postpartum clinics, the tools are also being used with women in other settings, as well as with fathers, elders, youth, local leaders and others in the community. For more information on either the job aids or training strategy, please contact either Peggy Koniz-Booher at URC/QAP Headquarters in Bethesda, Maryland (pkoniz_booher@urc-chs.com) or Deborah Ash at URC/QAP Country Office in Dar es Salaam, Tanzania (dash@urc-chs.com). (USAID) under Contract Number GPH-C-00-02-00004-00.